CHARTS FROM 1300AD TO 1350AD COMPARED. IS THE RICCARDIANA MS 3827 THE MASTER TEMPLATE? 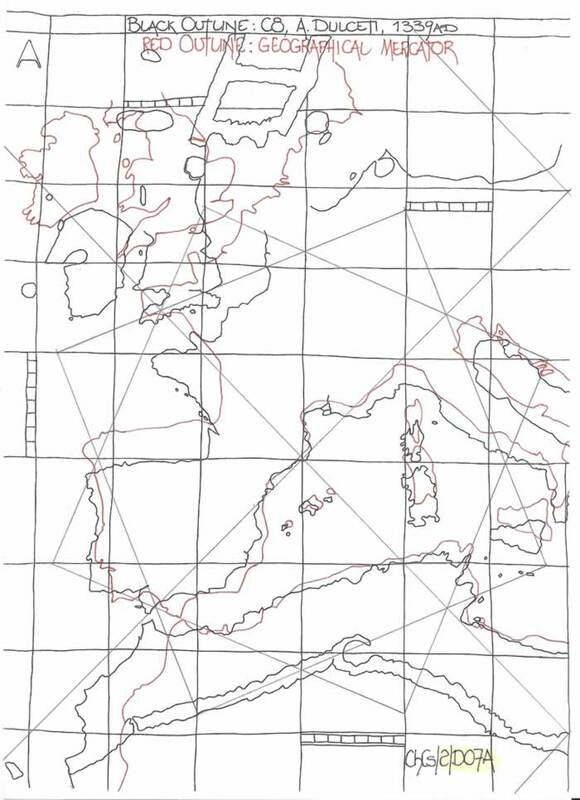 The format for this comparative study of five more charts was set down in my text ChCs/1, where each chart was first compared to a Geographical Mercator chart and then to each other which included the Riccardiana ms 3827 chart to evaluate their possible templates. These five charts are as numbered in ‘Les Cartes Portolanes’; C6, G da Carignano, 1327: C7, A de Dulceto, 1330: C8, A Dulceti, 1339: C9, (A Dulceti) ?1339-1350?, and C10, Ristow-Skelton 3 (1325-1350). The Riccardiana ms 3827 chart is LCP reference C4. Having determined that C4 is perhaps a master template or drawn from a master template, it is necessary to compare all charts to C4 and examine just how much this template was used. NOTE. For total comprehension by readers I suggest that the text ChCs/1 is studied prior to this text being read. It commences the format chosen of few words and many diagrams. C4; Riccardiana ms 3827 is held in Florence at the Biblioteca Riccardiana. It was originally dated to the first quarter of the 14th C. and is 52 x 92cms, illustrated upon pages 104/105 of L.C.P., and is classified as an anonymous Genoese Chart. C6; Held in Florence, ref. As. CN2, was drawn by Giovanni Mauro da Carignano in 1327. He was the rector of the church of San Marco al Molo from 1291 to 1330AD. The identifying inscription reads, Presbiter Joannes rector sancti marci de Janua me fecit. It was destroyed during the 2nd WW, but fortunately a black and white photograph survived. It is illustrated upon pages 328/329 of L.C.P. 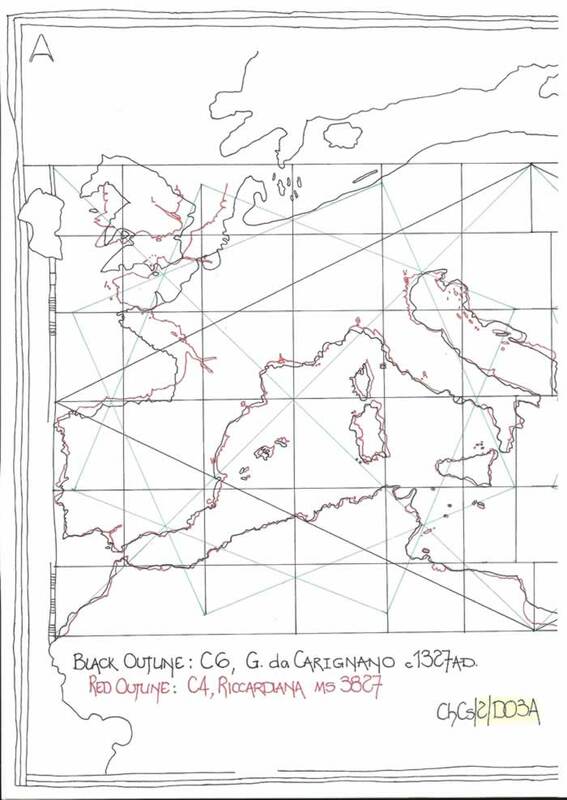 This is not the only illustration available as one exists in the text, “The Genoese Cartographic Tradition and Christopher Columbus” by Professor Gaetano Ferro, Istituto Poligrafico, Roma. See plate V and text pages 30-34. C7; Held in Florence, ref col 1 Corsini, drawn by A de Dulceto in 1330. It is 66 x 107cms and is illustrated on L.C.P. pages 114/115. This chart variously dated to 1325 and 1330 and noted as drawn by “Dalorto” or “Dulceto”, which is a subject of contention. C8; Held in BnF, Paris, Res Ge B696 and drawn by A Dulceti in 1339. It is 72 x 102 cms, but slightly mutilated (cut down). It is illustrated on L.C.P. pages 120/121. C9; Held in London, BL ms Add. 25691, and is attributed to A Dulceti. It is 54 x 112 cms and dated to 1339-1350. It is illustrated on L.C.P. pages 126/127. C10; Library of Congress, Ristow-Skelton 3; It has a Genoese attribution and is dated to the 2nd quarter of the 14thC. It is illustrated on L.C.P. pages 140/141. THE RICCARDIANA MS 3827 EXPLAINED; C4. The chart is illustrated here-in as diagrams ChCs/2/D01A & ChCs/2/D01B. It is a basic diagram indicating the Wind Rose graticule and Scale bars for reference. 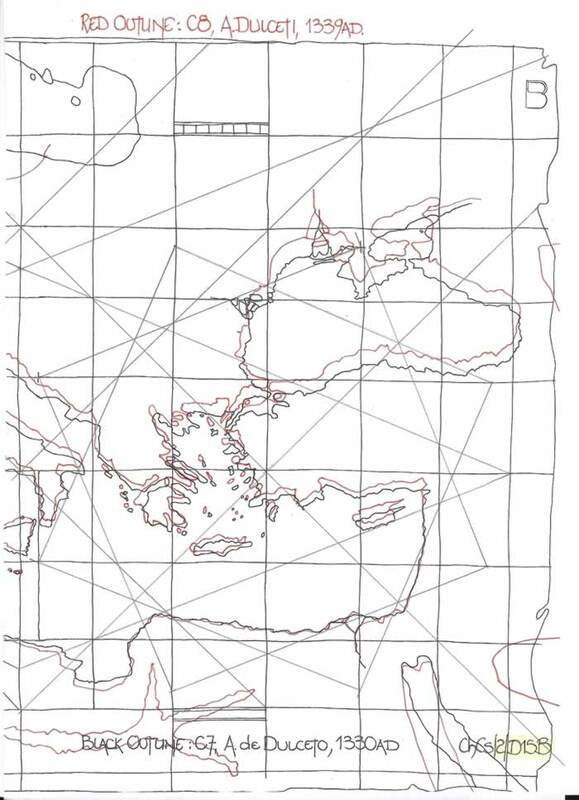 It is a fully developed Portolan Chart and regardless of the final agreed dating, now ranging from my 1300-1310 to 1325AD by others, it nevertheless required developmental forerunners to be so geographically acceptable. 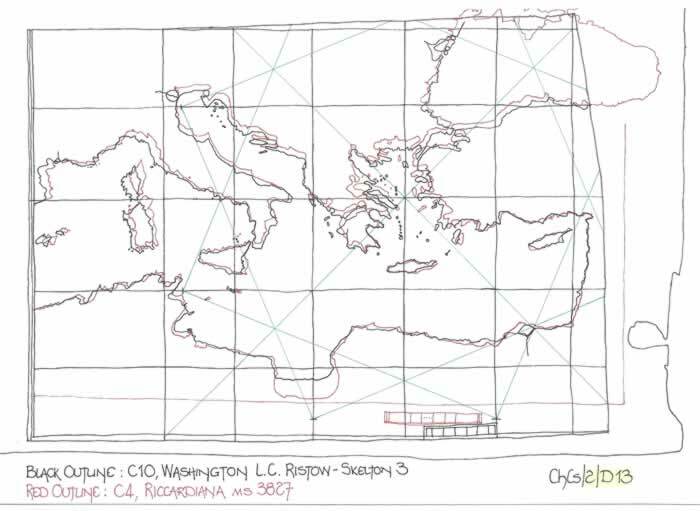 In text ChCs/1, illustrated on diagrams ChCs/1/D14A & D14B the Riccardiana Chart and a Geographical Mercator chart are overlaid for comparison. Had the Italian peninsula and thus Corsica/Sardinia/Sicily been drawn latitudinally correct instead of several degrees northward the relative comparison carried out would have proven just how accurate the chart was. Thus there was exceptionally accurate geographical information available to cartographer in the period preceding 1300AD. 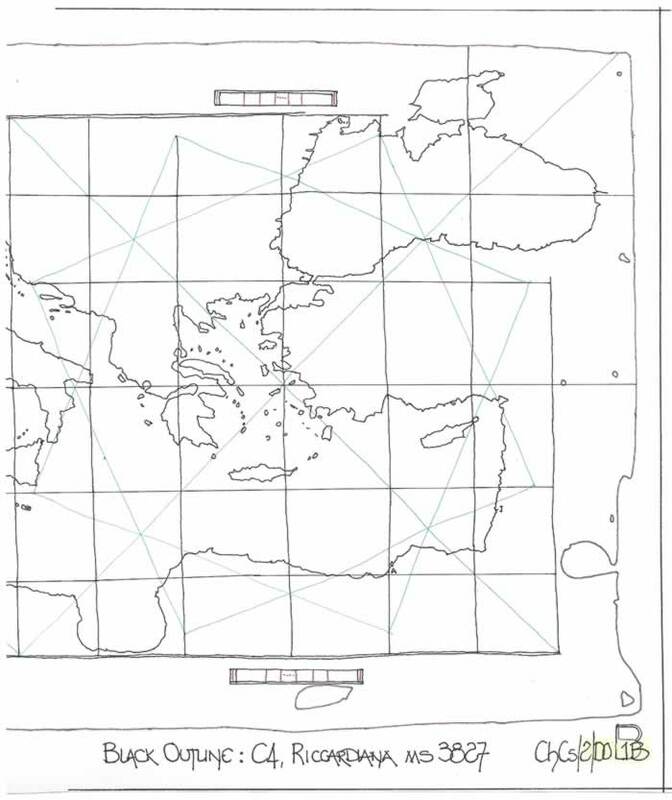 If my text ChCs/1 is studied the conclusions make it so very apparent that a map of the Mediterranean Sea basin had been developed, that is a proper geographical map, oriented NSEW, and not slewed to suit a magnetic north point such that it could be copied and then the map slewed to form the Portolan Charts we see today. 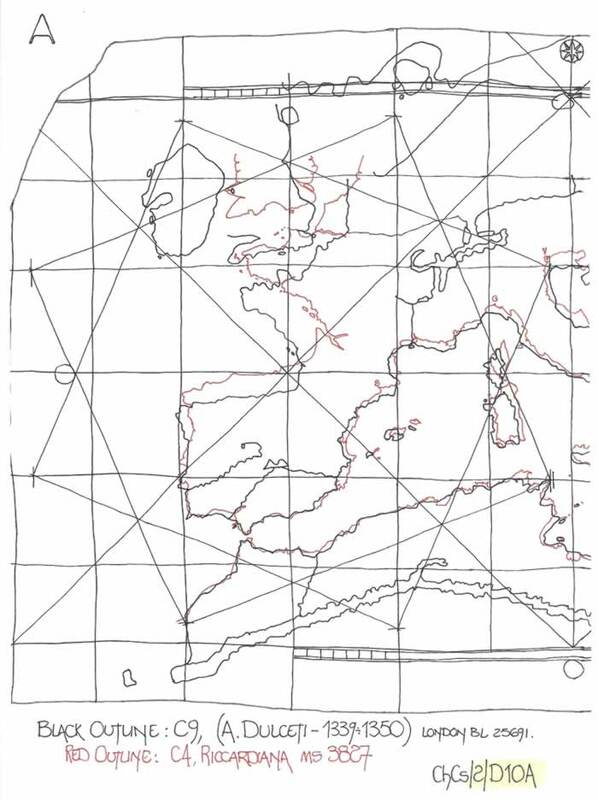 The slewing of the map in the Portolan chart is not constant and is fully discussed in my ChPo/1, ChPo/2 and ChPo/3 texts, which also indicate that the position of the map upon the wind rose graticule is arbitrary. This is confirmed in ChCs/1 by the diagrams, but was originally shown to be so within my ChLcP/1 text, where the R J Pujades theory of latitudinal positioning was shown to be a false premise. Those texts are fundamental to this research. 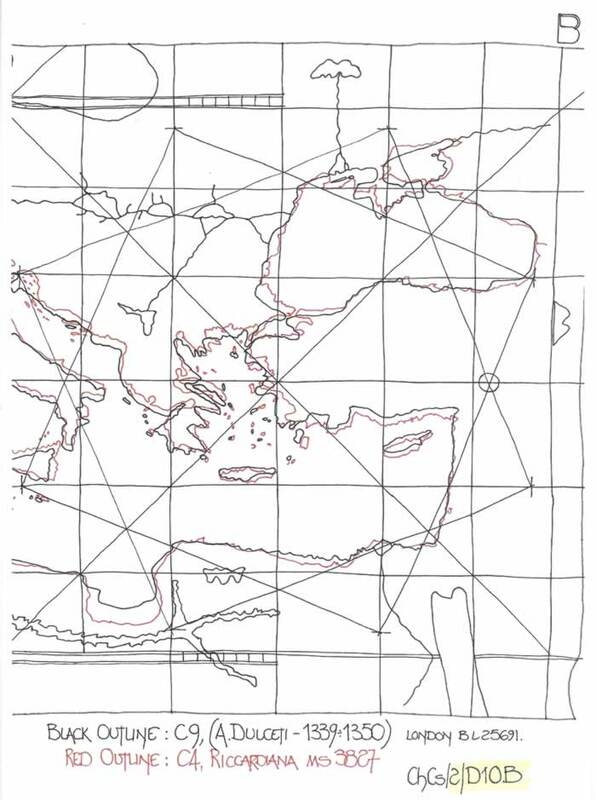 The possible antecedents’ of the Riccardiana ms 3827 chart are to be discussed in a separate paper which will include an indication of the simplified copying techniques which could be applied to change the scales of the charts copied from ms3827, or its own original template. I do not subscribe to the idea of tracing small areas to produce a total Portolan, neither do I agree with the idea of pricking and pouncing as my ChPo/3 text illustrates. This chart is the first extant Portolan Chart to include both the British Isles and the Baltic Sea. 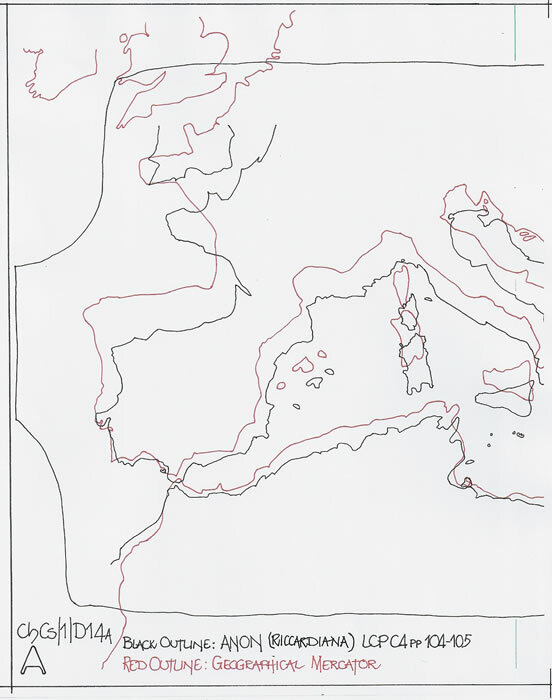 The basic Mediterranean Sea basin is quite acceptable comparatively and includes the northerly shift of the Italian Peninsula whilst maintaining the correct longitudinal positioning of the major Islands. The shape of Great Britain is obviously taken from either mariner’s accounts and or sketches. 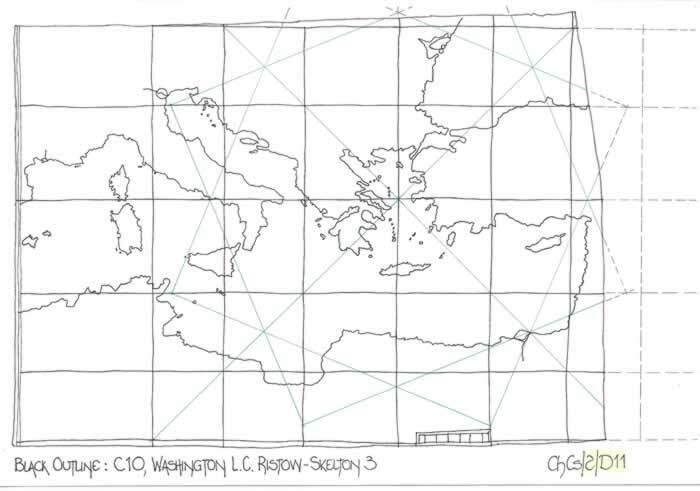 But the more likely scenario is that maps emanated from the Anglo-Norman period, when information was sent to Sicily, (read cgId/1) with maps such as the B L Cotton Tiberius B map. Had C6 included Scotland (it appears to terminate at Galloway or an Ayr to Edinburgh alignment) there may have been a template for future Atlas improving on the Vesconte models and aiding the Dulceto form of the same. The curious omission of Scotland is akin to the information that the Roman Army would have had after their withdrawal back to the 55N latitudinal line, that of Hadrian’s Wall. That is, Rome ceased to be interested in Scotland and their maps were thus curtailed. I detail this possibility in the “Rm” texts on the website. The Baltic Sea commencing with the Jutland Peninsula, (unfortunately set to far south and obliterating part of France, Holland and Germany in the process) is an idealized shape from verbal descriptions, but includes a valiant attempt at the southern Scandinavian coast. The reasoning is discussed later in this text. It would be foolhardy given the near perfect alignment of both charts to state other than in all probability the C6 Chart is a direct copy of the C4 Riccardiana chart for its Mediterranean Sea basin layout. But the C6 chart as discussed includes sea areas not upon the C4 chart and is thus distorted in the positioning of France and the Low Countries. 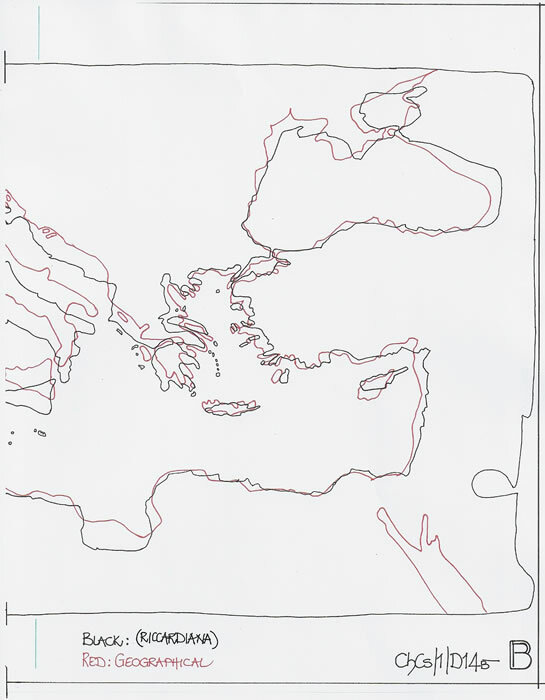 It is also reasonable to opine that to include the Baltic Sea etc upon the vellum skin Carignano had to sacrifice a more accurate size for France and southern Britain, by shrinking their latitudinal spread. 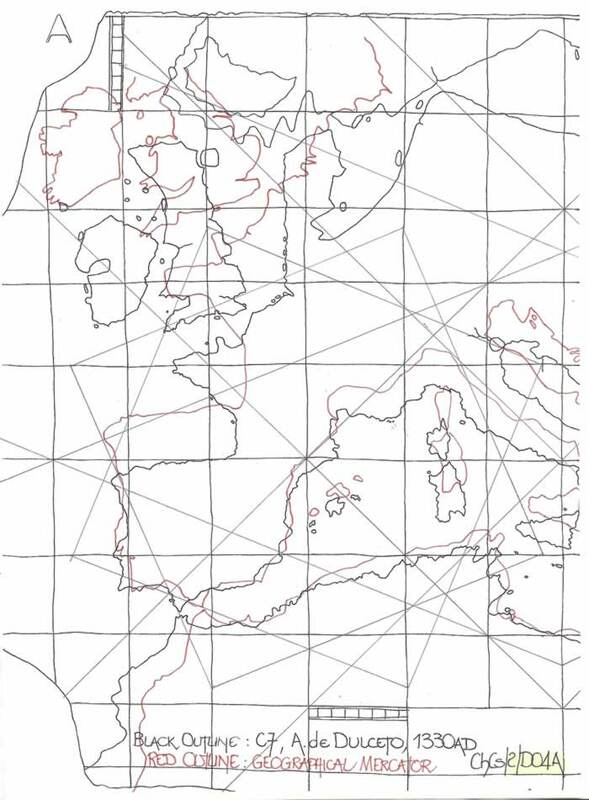 Thus the making of a very accurate Portolan Chart for most of NW Europe was lost because of the size of vellum skins available. It would also have been unwise to alter the Mediterranean Sea basin, and thus the template was used here for the basin, but amended for the Iberian Peninsula and the northern Europe areas. It is also obvious that G da Carignano was collecting data from the Genoese sailors via his Church at the harbour. Genoa was a maritime republic from c1100AD, with trade routes extending to Britain and Holland. In c1150 the Hanseatic League, a group of merchants basically in the Baltic Sea extended their trade links through Germany to Holland and Britain. Hence the information no doubt arrived back in Genoa to enable C6 to be drawn. Thus we can speculate that as Pietro Vesconte had possibly decamped to Venice, the new information via the Genoese sailors given to Carignano was not immediately transmitted outwards for Vesconte to utilise. However, as the C4 chart is the probable template for all of these charts it must still have been in Genoa, or the C4 template was in Genoa. This point must be considered regarding the shift to Majorca by Genoese cartographers. 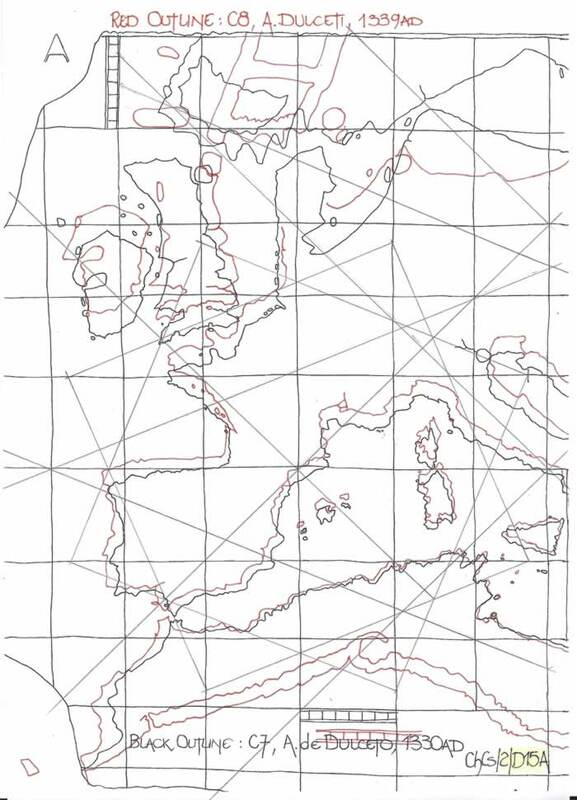 The C7 chart of 1330AD has the reduced France/N Europe, an enlarged Jutland Peninsula and a much reduced Baltic Sea. However the British Isles are well drawn and the positioning apropos Europe and Jutland is surprisingly good, even though drawn southerly by comparison. 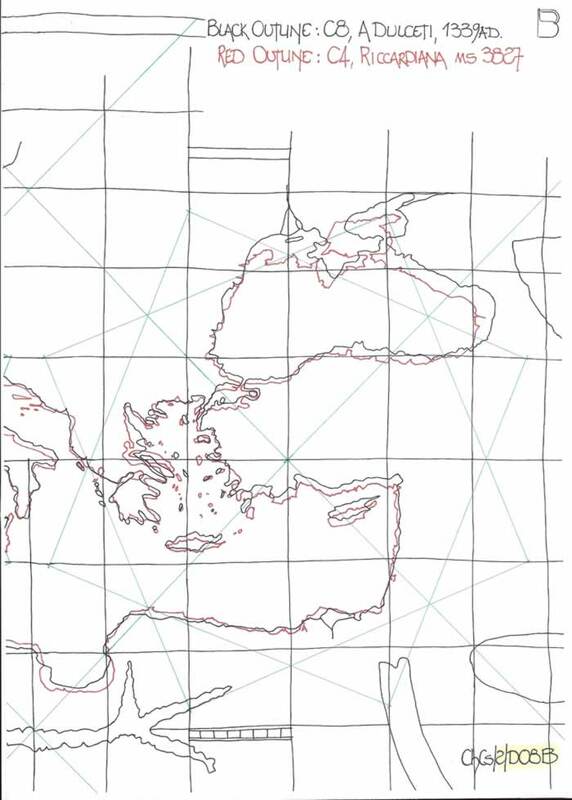 The Mediterranean Sea layout is similar to the preceding charts, although the eastern area of the Black sea coastline is extended and the western area of the Mediterranean Sea, the Pillars of Hercules, is not as accurately positioned as we have previously observed. Thus the length of the Mediterranean Sea is increased from the Toe of Italy to the Pillars of Hercules. Italy and the major Islands are moved northwards, a typical trait for Portolan charts. 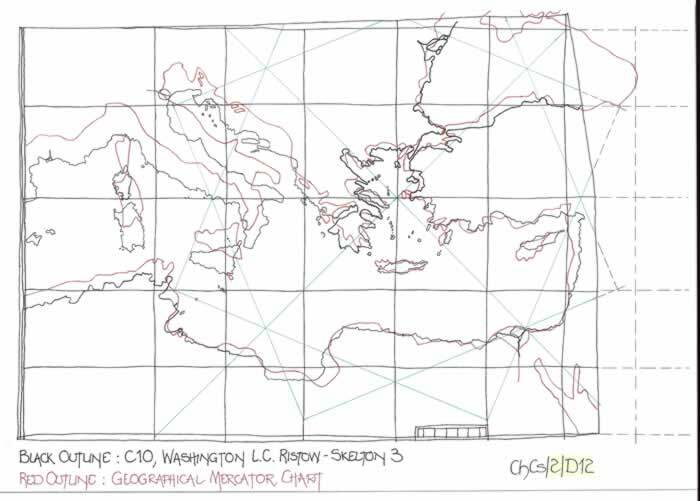 It is therefore open to us to opine that the central section of the chart was accurately drawn, but the eastern and western extremities were less accurate. 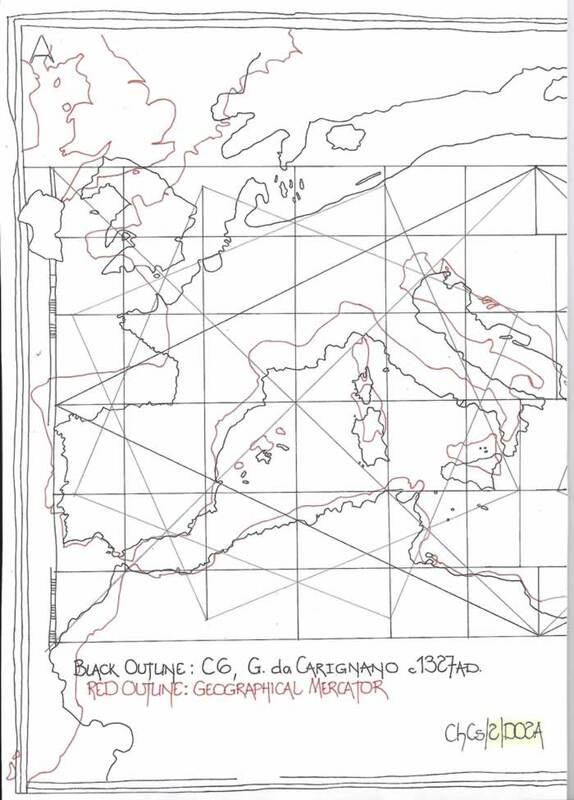 The difference in information available to C6 Carignano and C7 Dulceto regarding NW Europe’s form is surprising given the Genoese connection, but obviously from a far more observant mariner or properly documented source. However when C6 and C7 are later compared our perceptions are perhaps changed. 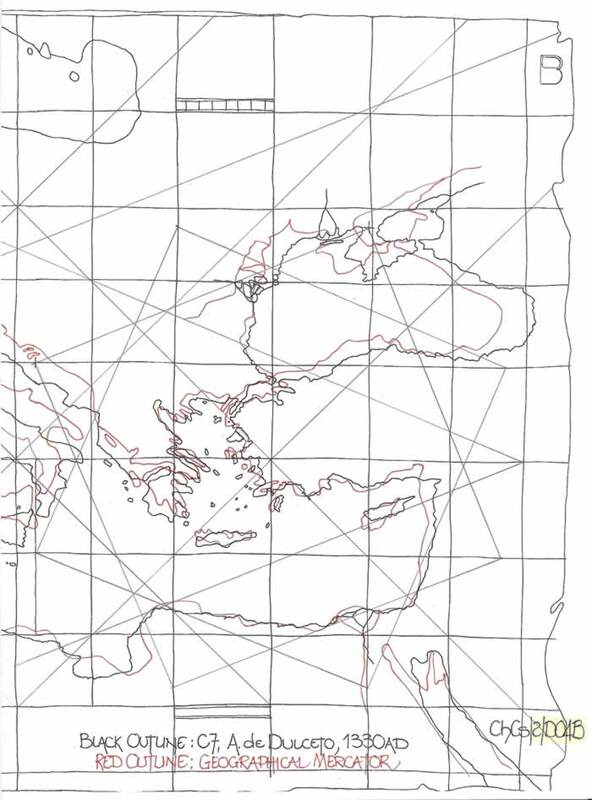 Other than the elongation of the western Mediterranean Sea from the Toe of Italy to the Pillars of Hercules it is reasonable to opine they are virtually the same chart in origination. That is the basic template was the same or perhaps a first copy of the template. The squeezing of NW Europe to permit the Baltic Sea to be included, the major trading route, as has been discussed, is obviously seen in the early 14th century as an acceptable compromise to the chart being drawn to a smaller scale and probably not as useful therefore. The chart size and thus the length of coastlines will dictate the numbers of toponyms that can be written. This inaccuracy could be attributed to multiple copying which leads to errors. 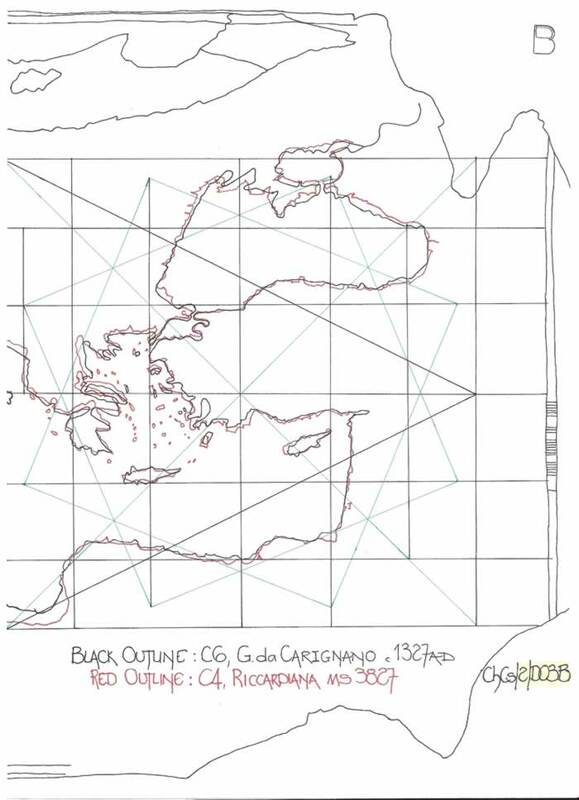 Having shown that the basic chart template for both charts is probably the C4 Riccardiana chart, the fact that the overlay matches excellently for France and NW Europe, which are curtailed similarly, and that the British Isles are positioned similarly, it probably indicates that both were drawn in Genoa. They are dated 1327 and 1330. 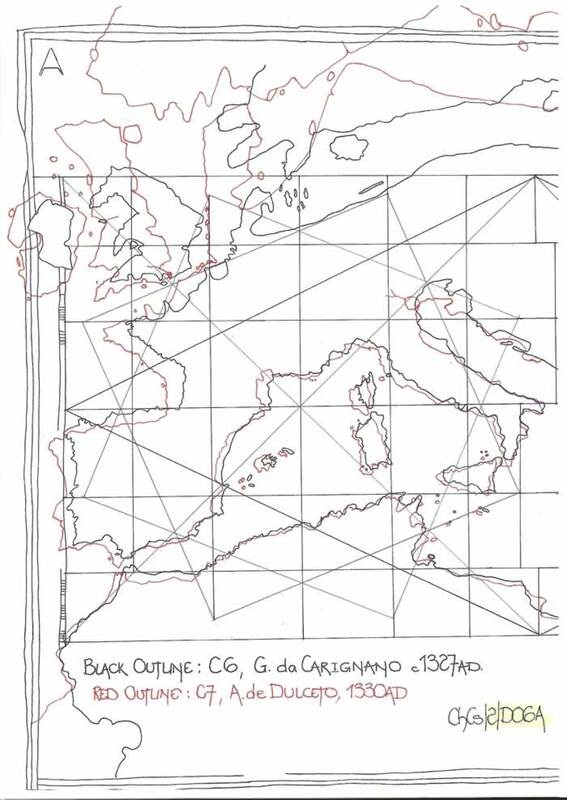 Could a copy of the Carignano chart have been made and taken to Majorca, or is it more likely that Dulceto was still in Genoa at this period of his cartographic activity? But, Venice has been posited as a possibility. But, if Vesconte did not know of the Carignano Baltic Sea and he was in Venice, would the more accurate British Isles etc be known? Thus Venice was out of touch then. This chart is very similar in comparison to the C7 Dulceto and the Geographical Mercator chart. There are slightly greater divergences but the overall chart to chart comparison is of similarity. 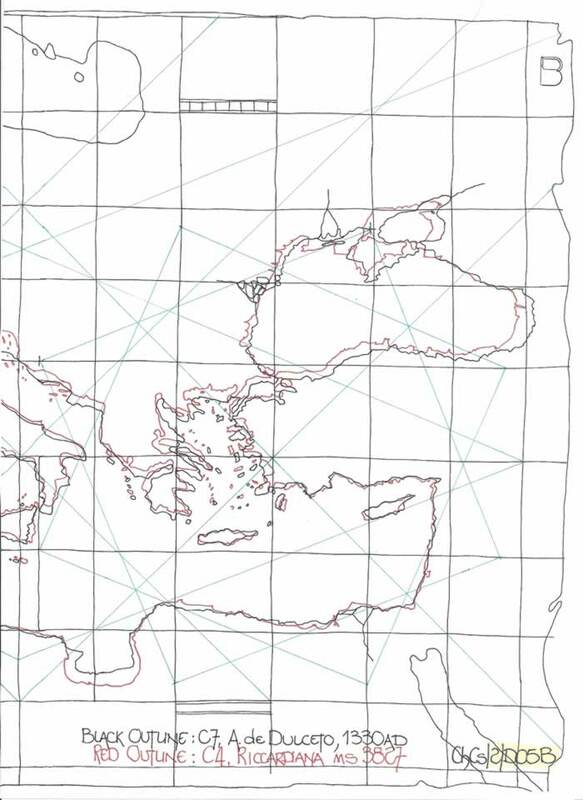 The Mediterranean Sea is slightly extended as the previous charts show from the Toe of Italy to the Pillars of Hercules. “For example, it will be sufficient, for now at least, to mention only in passing the map of the known world made in Mallorca in 1339 by Angellino Dulcert and preserved in Paris at the National Library. According to Nordenskiold and other foreign scholars, this was the prototype, or one of the prototypes, of the so-called “Catalan school”. According to Italian scholars who have studied the matter, Dulcert was none other than the Genoese Angelino (or Angellino) Dalorto, who had moved to the Balearic Islands: I shall have occasion to speak of him later”. 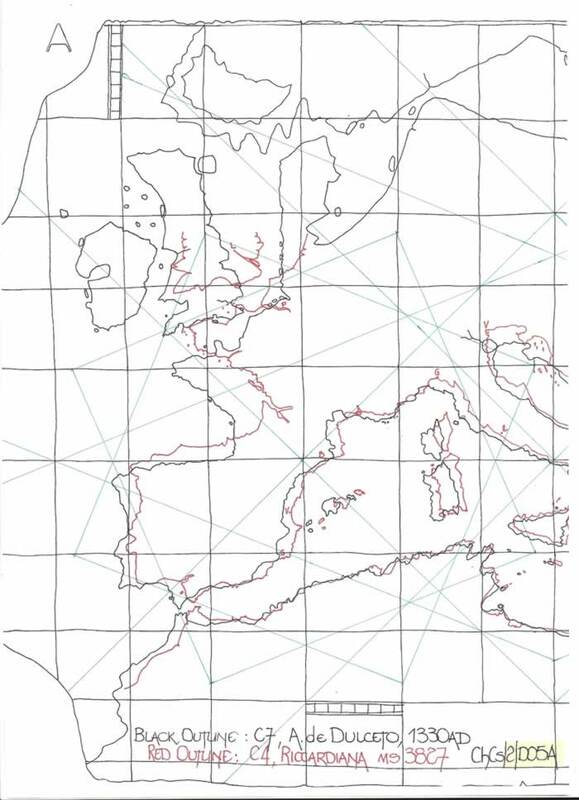 “Dulceto chart of 1339, when superimposed on the (Dalorto 1325) preceding chart, matches it almost perfectly, even with respect to the north western and northern coasts of Europe. The outline of the shore, sharp, sure and elegant, shows a knowledge of landings and coastal features which are more numerous and detailed than in previous charts or in the world map of the Catalan Atlas of 1375. Hence Magnaghi concludes that this chart, still with the double system of Wind Roses and very few decorative elements, “represents that type of world map —- land map and sea chart at the same time —- that was later copied” by various map makers”. been seen the western Mediterranean Sea is extended for apparently no reason. Thus we are able to opine that these charts are all the “children” of one master chart, probably C4 Riccardiana, or the chart from which it was drawn. There is insufficient data to state clearly. 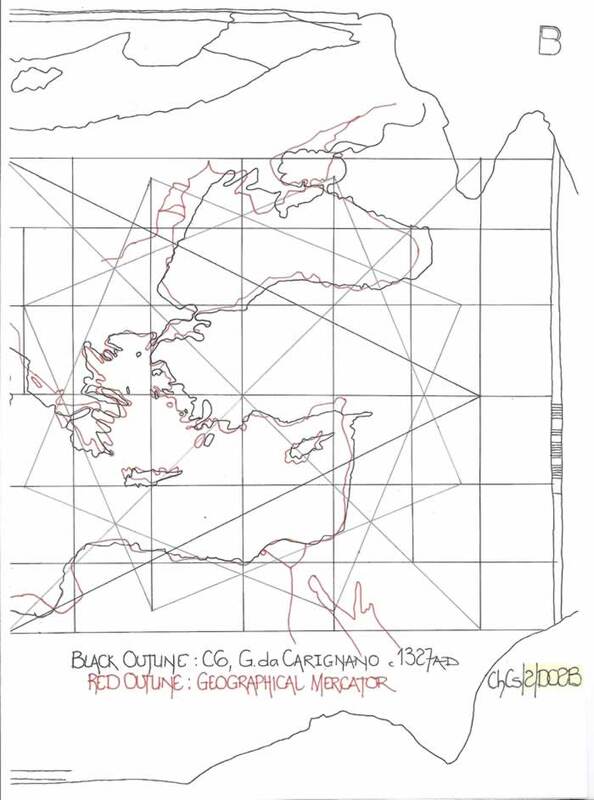 Here we see an approximate rerun of the C7 and C8 comparisons to the Geographical Mercator chart, except that in this case the gradual increase in the length of the western Mediterranean Sea has been corrected and thus the longitudinal alignments return. What was the impetus or factor which prompted (Dulceti) to correct the over length seen on the C7 and C8 charts. Was it that a slight mistake on the C7 chart was amplified on the C8 chart and thus when the C9 chart was drawn, it was audited for accuracy and the error was corrected? It begs the question that perhaps the dates of the charts should be reversed such that C9 is the accurate beginning and then C7 and C8 are progressively in error? That would make far more sense, particularly as both the attribution and dates of this chart are unclear. Normally copying produces more errors. Having corrected the over length of the western Mediterranean sea, the result is a near direct copy of the C4 Riccardiana ms 3827 chart. The alterations are as before to suit the additional lands in the northwest. This further suggests that C9 should be an earlier chart than C7 or C8 as copying tends to be less accurate with time. C10, Library of Congress, Ristow Skelton 3. Originally a chart including the whole of the Black sea area it is now reduced as shown. 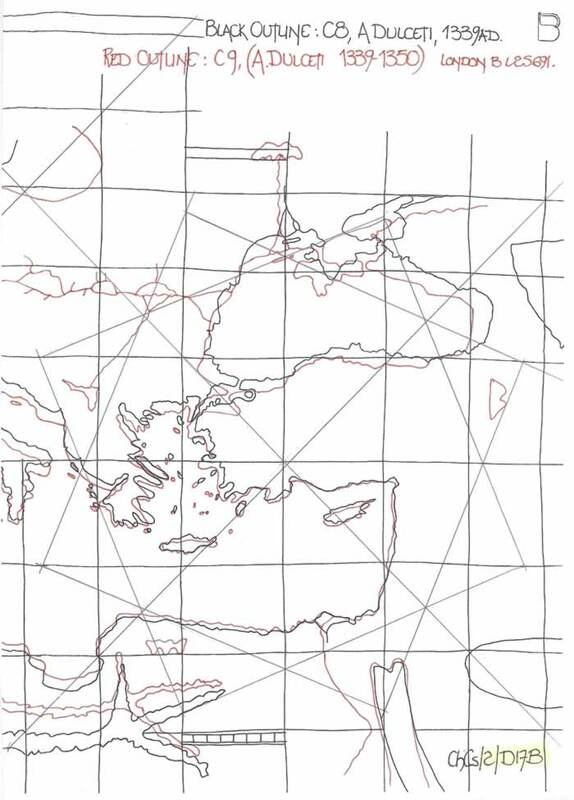 The Wind Rose Graticule can be used to evaluate the lost portion of the chart in its northern and eastern sections. Thus it is possible to opine that at least one graticule segment in the north is missing and at least one or more in the east. The graticule construction is fully discussed in my texts, ChWr/1 and ChWr/2, which include the scale bar utilisation. There is a general comparison to be made, but perhaps the apparent accuracy of previous charts apropos the Geographical Mercator comparison is lacking somewhat in this chart. However it is a visual exaggeration of the discrepancies and because of the reduced size of the chart should not be read as definitive. It corresponds to the longitudinal spread of the parts shown and has the latitudinal spread similar to the preceding charts. Having been so reduced, it is difficult to judge its overall form for this comparison. The C10 chart is an acceptable copy of the C4 Riccardiana chart where it is possible to compare the two. But, is it from the same original template or a copy as has been discussed. However, it is intriguing to note that the western Mediterranean Sea is increasing in length from the Toe of Italy much as the Dulceti C7 and C8 charts had. There is not enough of the C10 chart to compare to the C7 or C8 charts but the similarity of expansion indicates that it could be a copy of a Dulceti chart which has been reduced in size, or it is an unrecognised Dulceti chart. Even though I have shown that the C3 and C4 charts when drawn with the Djerba to El Arisch distance equalised they are probably drawn from the same template, and C3 is an enlarged version of C4, I have included this comparison to ensure that the all known Genoese charts are included here-in. Perhaps it is no longer an unknown chart. probably copied from the C4 Riccardiana chart. 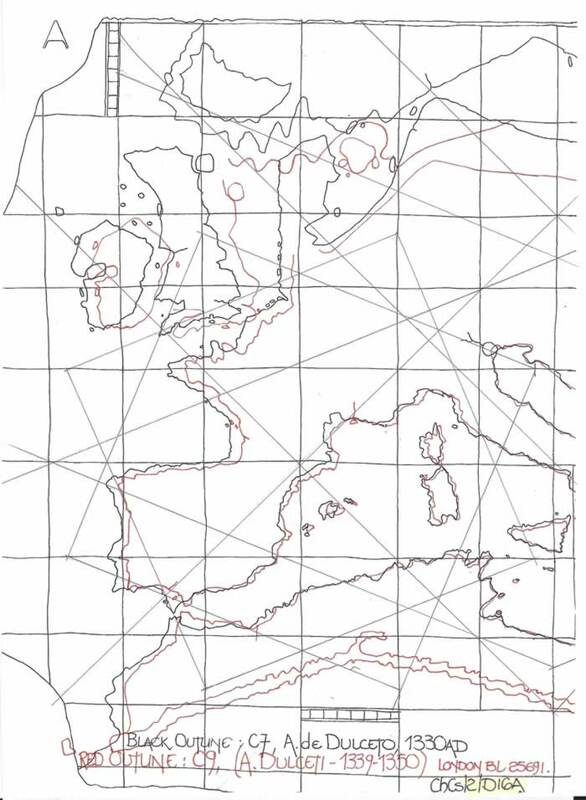 As for the template, I have compared them for draughtsmanship accuracy, and this clearly shows the western Mediterranean Sea expansion from C7, 1330 to C8, 1339. There are obvious differences between these charts which preclude a master chart being used as an actual tracing template or pricked hole/pounced coastline. They are after all 9 years apart and if the actual template was unavailable, but a copy of a preliminary or base chart was made it would account for the discrepancy. 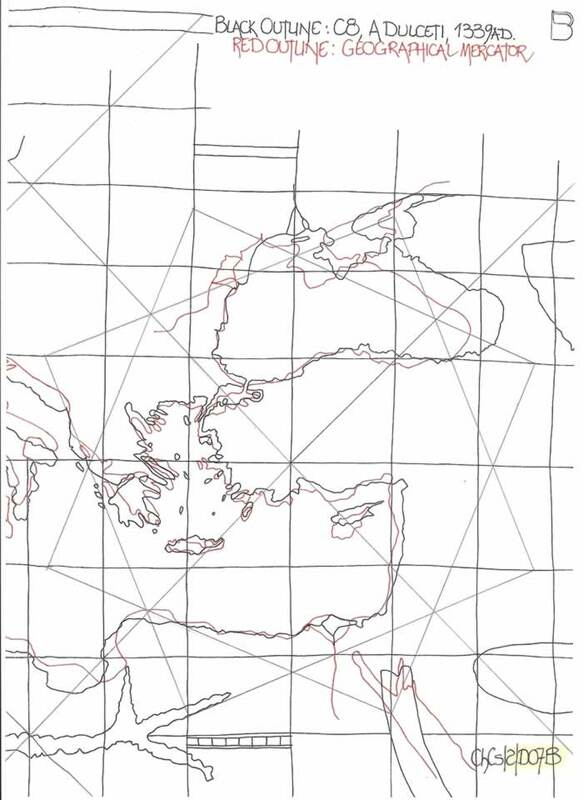 The expansion of the Mediterranean Sea is perhaps a simple mistake to make when using a copying grid or similar, which will be discussed in a following text regarding the draughtsmanship of these charts. 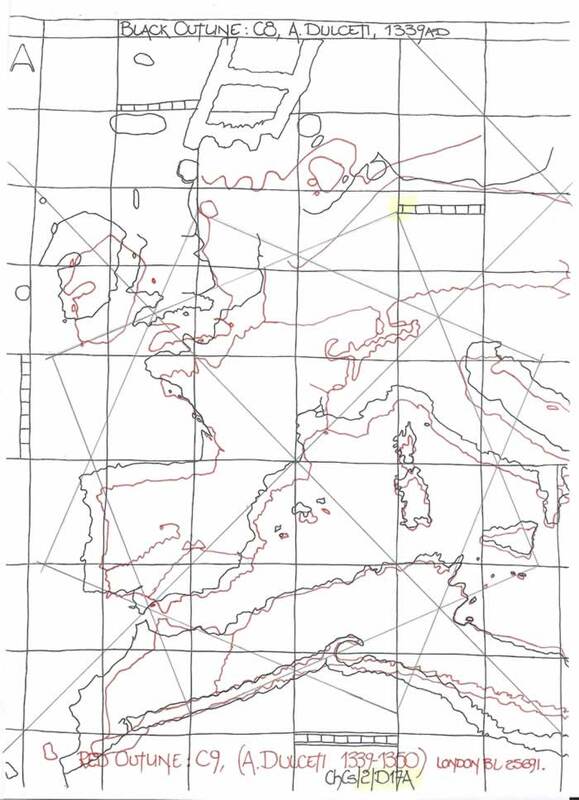 This latest chart, the C9 chart (by extant dating) has the western Mediterranean sea at the correct length and thus the C7 and C8 charts are corrected. However it is clear it was drawn from the same, or a copy template. This clearly indicates that the atelier was not using a single original template as the inherent differences are too great. It should not preclude the use of a copy of a copy of the same template as the inaccuracies tend to grow with such copying. The similarities are seen in the profiles but the copyist by using the more accurate profile has exposed the problems with C7 and C8 apropos C9. Note that the scale bar indicates the 7 ratio division of the wind rose graticule as seen originally on the Pietro Vesconte diagram. This fact would also indicate that C9 is probably a copy of Vesconte’s chart and thus is earlier than C7 or C8 and in all probability from Genoa. 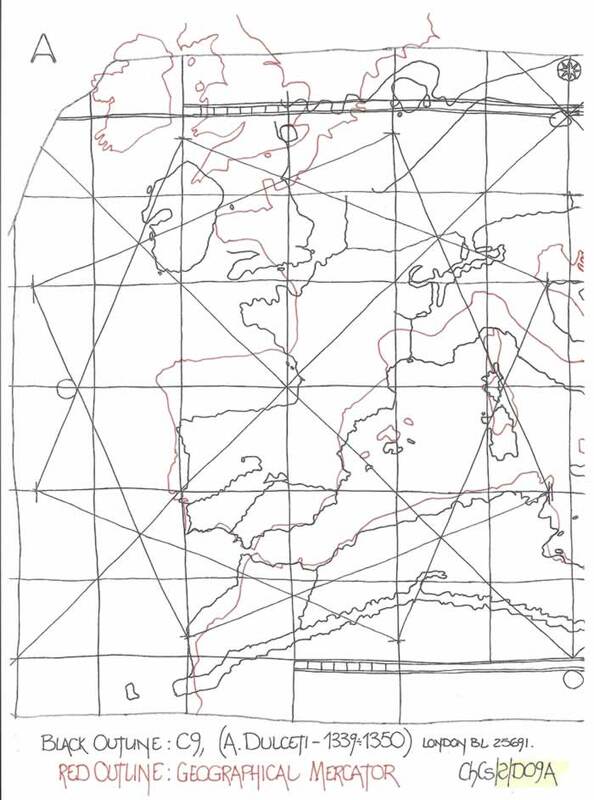 My texts ChWr/1 and ChWr/2 fully detail the construction via the draughtsmanship of the wind rose graticule and include a section comparing the medieval mathematics of the Marteloio and the wind Rose construction indicating they are one and the same. It would appear that the findings of ChCs/1 are fully justified as they follow through into this second tranche of the investigation. 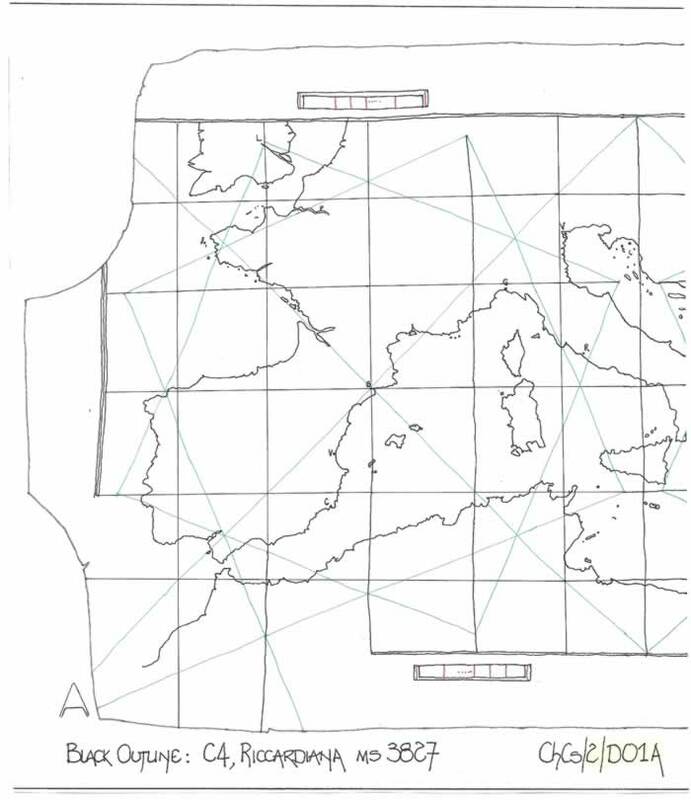 Thus I can opine that the Riccardiana ms 3827 Chart (C4) is the template for many of the original or first Genoese Charts. That said, there is the possibility that the C4 chart is not the first and has a sister chart of similar age, or even a predecessor chart from which it was drawn. But there is the distinct probability that the C4 Chart, even if it is not the actual first chart is perhaps the culmination of many attempts to construct a Portolan Chart with the magnetic deviation indicated. 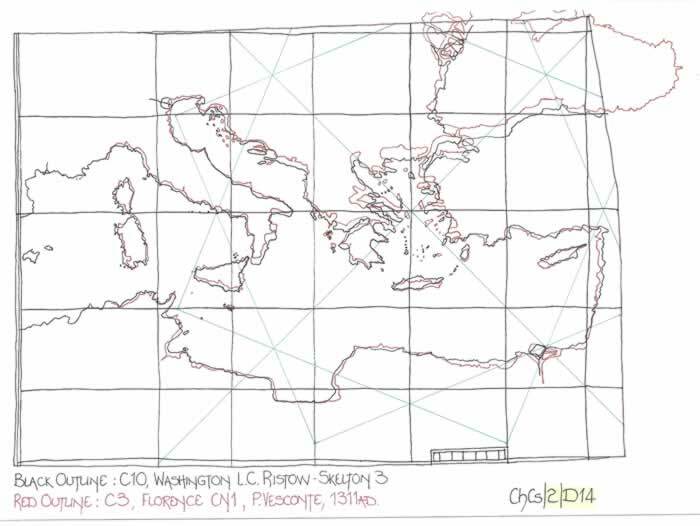 In the 13th century the magnetic deviation varied from c5E at the Pillars of Hercules to c11E at the Genoese longitude and then to c16E at Alexandria. 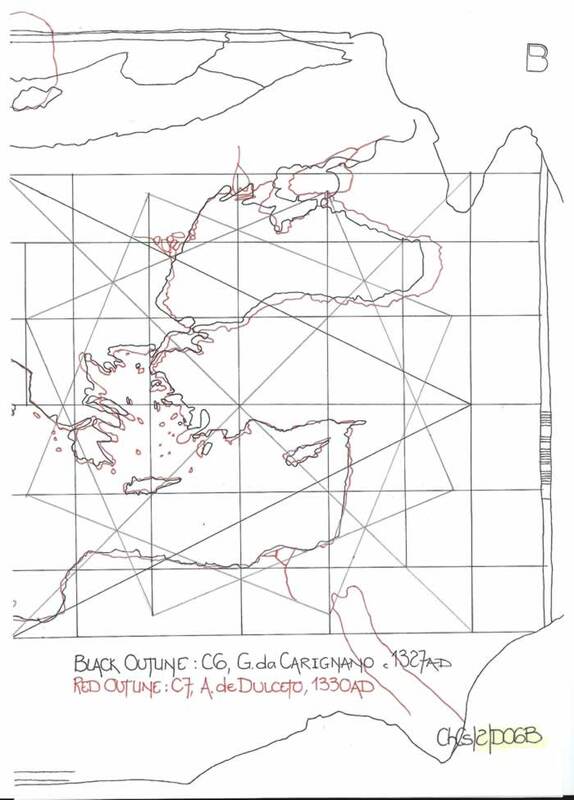 Hence the Genoese charts have the latitudinal centre line of the Mediterranean Sea, 36N, slewed c11 degrees anticlockwise. 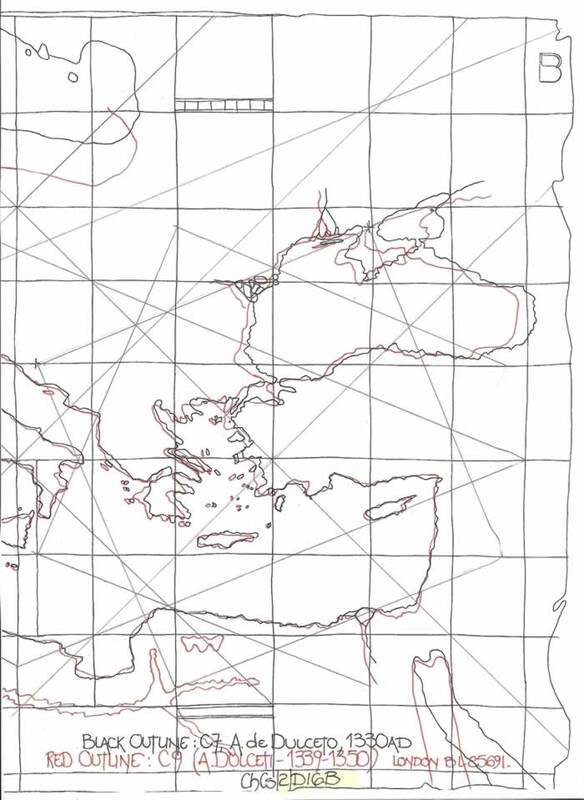 But the Wind Rose graticule (see ChWr/1 and /2) is drawn NSEW. Therefore it is open to opine that the draughtsman knew the difference between Geographical North and Magnetic North as indicated at Genoa, and slewed the chart to enable the magnetic compass to be utilised. 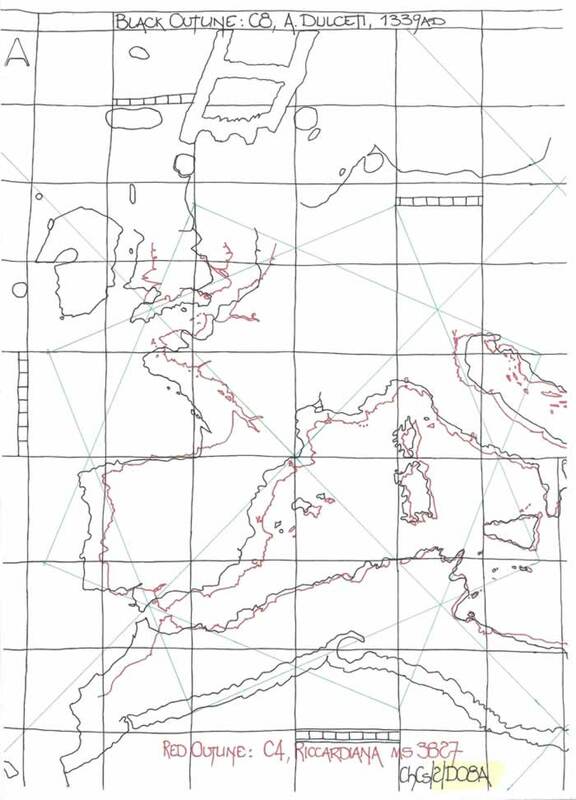 Thus in the mid 13th century there was in all probability a very accurate Geographical map of the Mediterranean Sea basin which was adapted to suit the new fangled compass. 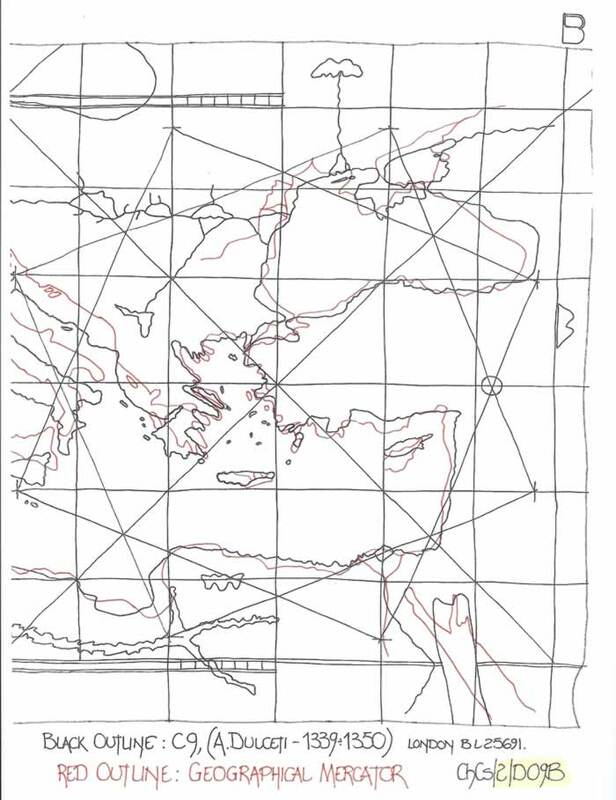 Therefore we should look for an accurate geographical map from the latest 1200-1250AD to enable the origins of the Portolan chart to be exposed. I have stated clearly in my text ChPo3 that I believe it will be found emanating from a Church/Monastery in NW Italy. The final conclusion must be that the Riccardiana ms 3827 chart was lodged in Genoa, copied by Vesconte before he departed for Venice and was still available for both Carignano and Dulcert to copy for their charts.